As our Heart of Compassion International Faith Community welcomes you today, Sydney of Toledo, Ohio, we who are gathered in the priesthood of the people, will ordain you in the laying-on-of hands. Since early Christian time, Jesus’ disciples laid hands on those called to serve the rapidly growing communities of Christians. Bonded in solidarity, they worshipped in church houses at great risk to themselves. They responded graciously to each other in recognition of their discipleship and their closeness to Jesus, who invited them to love one another, as he had loved them. This love was expressed in their prophetic witnessing to the people as they continued ministering and teaching, as Jesus had modelled so well. These were dangerous times for the early Christians, as it had been a dangerous time for Jesus. He fully lived the public life that led to his necessary surrender to the political forces bringing him to his death. Yet, in the face of those realities or perhaps because of them they led their lives of service to the poor and marginalized. They undertook strenuous travels such as are required in foundational endeavours. They had names both familiar and unfamiliar to us: Phillip, Barnabas, Theophilus or Theo we might say, and Andy or Andronicus and the martyr, Stephen. 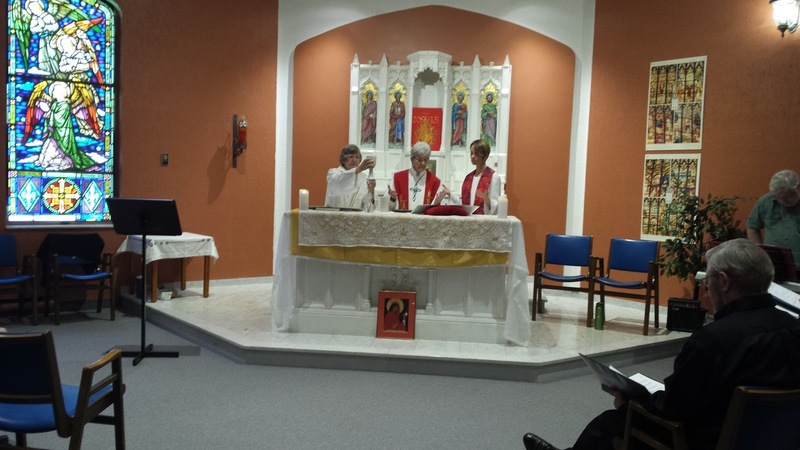 There was Mary, Mother of Jesus, Mary of Magdala and many other women, And then there was the other Theo, Theodora, the woman bishop, as well as bishop Aleksandra Veneranda, and later, but still early in Christian history, and as far away as France, Maria Venerabilis and in Ireland, bishop Bridget of Kildare. Archeologist Dorothy Irvine, identifies these women through catacomb depictions along with priests Flavia Maria, Vitalia, Leta, and many women deacons: Athanasia, Phoebe, Agatha, Posidonia, of Greece and Macedonia, in Rome, Junia, in Alexandria, Apolonia and in Jerusalem, deacon Sophia. For Sydney, humble service is paramount in her way of being in the universe. In the gospel reading from John, Jesus washes the feet of the disciples just prior to going forward into his dying. The hospitable heart, the open compassion, and mercy inherent in his way of approaching his task speaks of consummate graciousness towards others, even when his own fears for the suffering he would soon undergo were intensely present. In this, we understand what the call to serve is like and this is the call of a deacon. 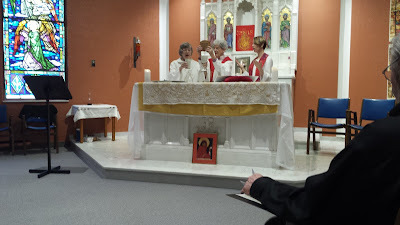 As a professed lay Carmelite of 50 years, Sydney is thoroughly acquainted with the deep contemplative and simple way of life adopted by the discalced Carmelites. She lives a life of simplicity and deep spirituality. It is this that she will engage in her coming ministry with the small, sacramental communities she will gather. The discalced Carmelite discovers the meaning of the word in the struggles of her religious formation. Discalced means “barefoot” and the significance of this reality would certainly hasten an understanding of a simple lifestyle. This was just one of the changes envisioned by Teresa of Avila, the 15th century mystic and leader of her Carmelite community. She was attuned to the need for reforming the monastic ways of Carmel life. Laxity had set in that prevented her Sisters’ spiritual development in simplicity and poverty, their initial purpose and commitment. 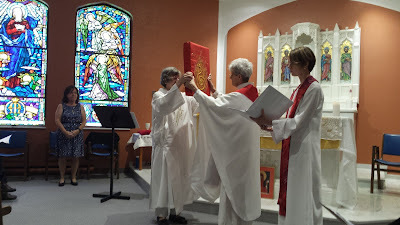 I became interested in this simpler way of being when Sydney suggested that she would like an apron instead of a stole as the symbol for her service as a deacon. Teresa engaged other reforms that took her all over Spain. She established new monasteries with a new rule that would challenge the corruptions in the religious life of the times. 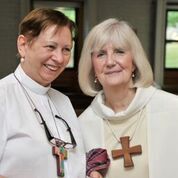 As in our Roman Catholic women priest movement, we are one with Teresa by challenging the poverty of thought and vision in the current clerical caste priesthood of our Roman Catholic Church. We have a Church structure that is still monarchical and grounded in patriarchal rule. It is a very long way from there to finding the capacities to entertain ideas and practices for equality of all kinds though, most specifically, gender equality. And yet, we are traveling around the world where we are speaking and practicing a model of priesthood for the sake of our beloved Church and with and for the people of God. “This is not for you alone,” bishop Patricia Fresen said to me when I was ordained a priest in the St. Lawrence ordinations, in 2005. No, it certainly is not for me or for any of us who come forward for ordination, valid ordinations begun in 2002 by Roman Catholic bishops in good standing with the Vatican. 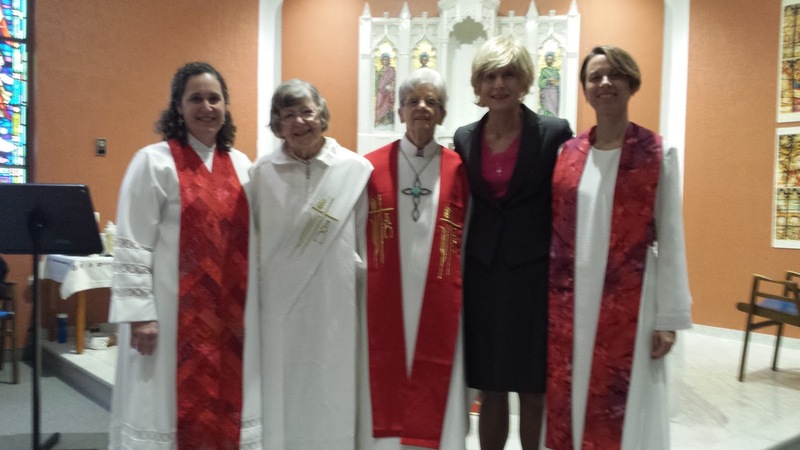 They knew that the ordination of women would never happen and they took a bold step to simply begin. In the Roman Catholic women priest movement, we bring forward something needing to be born as did Teresa in her time, and as did Paul and all the apostles and disciples, men and women, in their time. They were starting again and continuing. They were pulling forward a necessity that had been forbidden, but a necessity, nevertheless, a necessity meant for someone else and not themselves. These ordinations are for the People of God. They are for you. 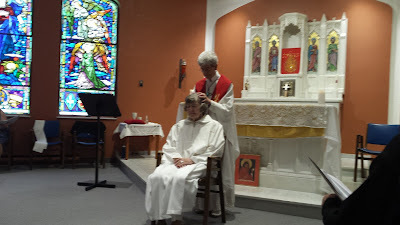 Our ordinations dwell in our deep thirst for change, the way change has always come to be in our Church. We could not be more Roman Catholic. No fanfare, rather a long chastening of our priesthood in a fiery furnace of apparent refusal that eventually comes to be seen as true and authentic because of this testing. Now in our worldwide women priest moment, we have 222 ordained women in 13 countries, including 16 bishops. By the end of this weekend, there will be 226 ordained persons: two priests in Albany, New York, a deacon in South Africa; and Sydney, our deacon. Very soon Sydney will be vested in her stole/apron while extending her many gifts beyond the tasks of housekeeping. “Once a deacon always a deacon,” the very first bishop in our movement, Christine Mayr Lumetzberger from Austria taught us. And so it is for all of us in this new time of a renewed Acts of the Apostles. We are in contemporary time and tomorrow’s time is not yesterday’s, even though all are inextricably linked. In our Priesthood of the People of God, we are deacons all. Thomas Merton, a modern day contemplative in action, teaches us that we need to be deeply mystical and contemplative, in our spirituality. But we can no longer go away to our private cell, as in the monasteries of past centuries, to experience that growth. Rather, we serve in the here and now, responding to the needs presented to us daily. Some days we whirl in it; mostly we are filled with a passionate love inspired by the Spirit of God and one another. Teresa of Avila knew how to do this as she bumped around in an ox drawn cart. Stricken by attacks of malaria (the same disease that possibly afflicted St. Paul during his many travels), she knew the risks and perils of her calling in conditions of extreme hardship. The papal nuncio to Spain described her as “a restless disobedient gadabout who teaches as though she were a professor.” Yet nothing deterred her. Teresa’s intimate relationship with Jesus sustained her, as He does us. The complexities we face today, amidst rapid global change and political unrest, are possibly greater than in any other time in history. To what now are we called? Our brother, Pope Francis, invites us into the “field hospital.” The field hospital is wherever our feet land – our homes, our workplaces, our places of worship and our cities. Here is where we serve as Jesus and his early Christians did, as did Teresa of Avila. The influx of Syrian newcomers at the doorstep of our Windsor community lands us at the centre of a call for hearts of compassion. Will we wash the feet of the dear neighbour, both local and global? 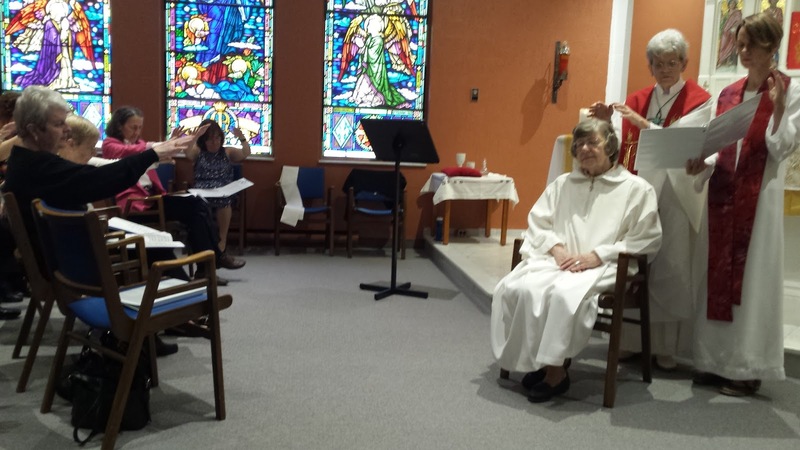 On April 13, Bridget Mary Meehan and Mary Theresa Streck presented "Women Priests, Then and Now" at Lifespring Saugerties Adult Learning Center at the Woodstock Jewish Community Center in Woodstock, NY. We gave a history of the International movement of ordained women who are leading the Catholic Church toward justice and equality. After showcasing this initiative through a PowerPoint presentation and YouTube movie, the audience participated in a lively discussion. Many had never heard of the Roman Catholic Women Priest movement and expressed solidarity for our success and flourishing. 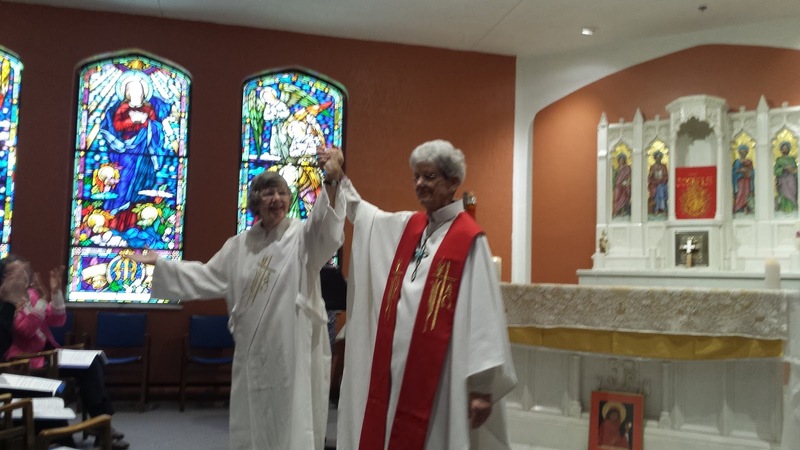 On Saturday, April 16, 2016 at 1 p.m., the Association of Roman Catholic Women Priests (ARCWP) will ordain Kim Marie Panaro and Jim Marsh priests. The presiding bishop will be Bridget Mary Meehan of Sarasota, FL. The ceremony will take place at First Unitarian Universalist Church, 405 Washington Ave., Albany, NY 12206. All are welcome. Kim Panaro says her spirituality really started as a youth minister in CYO as a young teen. “My spiritual path has been rich in women and men who teach and inspire me. For me, being a mom has been the greatest teacher. The better a parent you can be that’s where grace comes in,” she said. Kim earned an undergrad in Religious Studies from the College of St. Rose and a MSW in Social Work from State University of Albany. She has served as a school social worker for many years. She is also a community peace and justice activist and has traveled to Nicaragua. 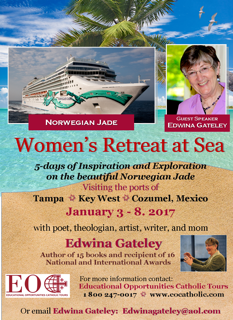 Over the years she learned her spirituality is finding Christ in the margins. “I always knew I had a calling in the church,” she said. “As a woman priest we don’t need to wait for permission to do what God calls us to be. As a woman priest I feel my ordination is to be a witness for Catholics who don’t feel comfortable in the church anymore. When I start talking to them about my priesthood, they are eager to listen and want to hear more.” Kim is an active member of the Upper Room Community in Albany. In this Holy Year of Open Doors we call on Pope Francis to move from condemnation to conversation with the Roman Catholic Women Priests Movement. In response to primacy of conscience, we ordain women in apostolic succession as an issue of justice and equality in our church. As a gesture of good will we ask our brother Francis to honor primacy of conscience by dropping excommunication and all punishments against us and our supporters. 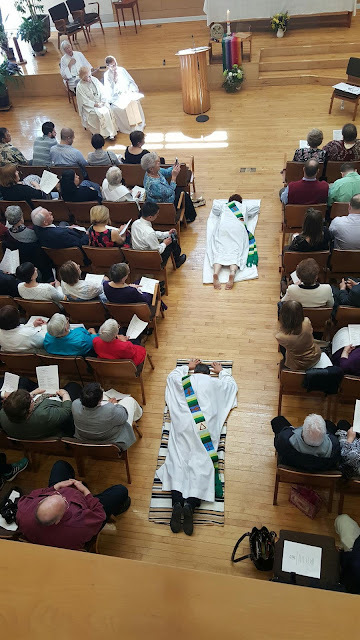 As faithful members on the margins of our church, we believe it is time to share our stories of priestly ministry in in respectful conversation with Pope Francis and begin a journey toward healing sexism in our church. God created women and men equal: “There is neither male nor female. 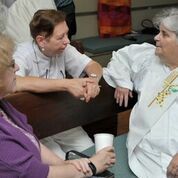 In Christ you are one.” (Galatians 3:28) As spiritual equals, all sacraments should be open to women. God calls both men and women to the priesthood, but Catholic women who are called are rejected because of their gender. co-celebrate the Eucharist (consecrate Eucharist, share the Word of God, and give mutual blessing). From the first ordination on the Danube in 2002 we have grown from 7 to 222 in 13 countries in our international movement. In the US we have 177 serving 65 communities in 31 states.